Traveller communities in Ireland are using international human rights law to monitor their housing conditions and to demand action from the local council. And they are not the only ones. A community of about 36,000 Irish Travellers live in the Republic of Ireland and 4,000 more in Northern Ireland. Part of the island’s history for centuries, this ethnic minority suffers extreme disadvantages in relation to health, housing, education and access to work. The Irish Economic and Social Research Institute reports that seven in ten Travellers live in overcrowded housing, eight in ten are unemployed and only one per cent have a college degree. According to the Human Rights and Equality Commission, Irish Travellers are almost ten times more likely to report recruitment discrimination than the White Irish, and 22 times more likely to report it in shops, pubs and restaurants. This article was published first in The Conversation. Record numbers of families now rent privately in Britain. Twice as many middle-aged people rent their homes compared to 2008, and it has been estimated that about one-third of millennials will rent for their whole life. Renting the house you live in has its advantages as it gives you greater freedom of movement and saves you other costs: insurance, service charge, deposit, mortgage interest, to name a few. Yet, for most people, renting privately is not really a matter of choice. It is the result of stagnant wages and the fact that house values rise much faster than the economy. This article was published in Left Foot Forward. Report shows how government and local authorities are failing thousands of vulnerable kids in Britain by shoving them into B&Bs and forgetting all about them. There are over 120,000 homeless children in England. And while children’s housing rights are proclaimed in a number of international treaties endorsed by the UK, human rights acquire true meaning when statistics and international standards give way to life experience. This article was written by Koldo Casla and Jamie Burton in Legal Action Magazine. In December 2017, the Equality and Human Rights Commission (EHRC) announced its own inquiry into the Grenfell Tower disaster (Following Grenfell: the human rights and equality dimension – statement from the Equality and Human Rights Commission). Unlike Sir Martin Moore-Bick’s inquiry, the commission will examine whether the public sector duty regarding socio-economic inequalities, ‘if in force, would have made any difference to what happened’ (page 5). The socio-economic duty is contained in Equality Act 2010 s1 and requires government ministers, councils and other public authorities to have due regard to ‘the desirability of exercising [their functions] in a way that is designed to reduce the inequalities of outcome which result from socio-economic disadvantage’. It complements the public sector equality duty set out in s149; however, successive governments post-2010 have declined to bring it into effect. If Virginia Woolf needed a room of her own to write fiction (and much more), Paula needs a place to call home to live her life and to raise her kids. But ineffective policies are blocking her at every turn. Paula is just one of thousands of women who cannot escape the trap of insecure housing after going through an eviction in Spain. More than 30,000 households were evicted from their rented homes last year alone, as in the previous one, and the one before. The number of households evicted from mortgaged properties does not fall far behind. Going through an eviction is a traumatic experience for everyone, but Amnesty International has documented that women often experience it differently—and more frequently. Women are overrepresented in part-time jobs, find themselves at the lower end of the pay gap, and regularly bear domestic care duties. Single-parent families, which are predominantly headed by women (in more than eight out of ten cases), often live in rental accommodations. Official statistics show that these families also face higher than average rates of poverty, social exclusion and material deprivation. Right to housing in Spain: What have the Romans ever done for us? Should we say thousands, tens of thousands or hundreds of thousands? 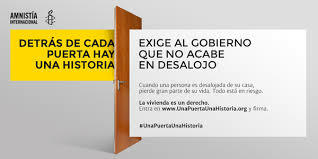 I must admit we were not sure how to start the report Evicted Rights: Right to Housing and Mortgage Evictions in Spain, published by Amnesty International – Spain on 23 June 2015 (see here in Spanish). According to judicial statistics, there have been nearly 600,000 foreclosure procedures since the beginning of the economic crisis in 2008. Luckily, not all of them have ended up in an eviction, neither do all affect first homes. So, if not all, how many then? If we check the data from the National Statistics Institute and the Bank of Spain, we will get some information about the number of households and first homes that have gone through a mortgage foreclosure since 2012. Yet, not even then we’ll have the full picture. It may seem strange, but to this day there are not yet official statistics about the number of people who have lost their home because they couldn’t keep paying back their debt to the bank.